Welcome to my steel guitar lessons website, where you will learn how to play in steel guitar fashion (dobro, weissenborn, lap steel) with a song-focused approach. All my lessons are carefully designed with this SONG-FOCUSED approach where you will learn any skills or theory in a MUSICAL WAY. Because whatever it is that you want to learn on an instrument, you should never forget to ENJOY YOURSELF and best way to do that is to LEARN SONGS or to PRACTICE MUSICALLY! If you’re getting started on the dobro, I’ve designed a FREE (to-be-completed) dobro beginner course where you will learn the basics of this instrument. From there, you can either dig deeper with my intermediate series or start learning songs. I also have a whole section of this site all about open D tuning and weissenborn (which you can also tackle using a dobro or lap steel tuned to open D 🙂 ) as well as a C6 lap steel and A6 lap steel series. "Thank you so much for your arrangements, Pat, they are beautiful. Your videos, sound tracks and manuscripts look very professional and I am extremely pleased with your products." "I bought my first dobro lesson from "Learning With Pat" and am very happy. I got "Sweet Beulah Land" to start. Pat, in the expanded lesson, takes a few measures at a time (short phrases) and iterates several times. I find I can follow what he is doing and after the 3rd or 4th iteration, I can play along. Next thing you know, you get through the entire song. The split-screen closeups of the right and left hands are great. Pat is trying to make sure you learn instead of just watching or listening to him play. I appreciate very much his teaching methods." "I highly recommend "Learning With Pat". The lessons are great and easy to learn. I'm 75 years old and have never played an instrument. I can also say Pat is very helpful if you need help. Thank you Pat!" "I'm just learning the lap steel and dobro and Pat's website is more to my taste than anything that I have seen. I like your adaptations and feel and will probably purchase several lessons over time. Thank you for making these lessons available!" "After some years of not doing anything with my dobro, I stumbled across Pat's site and thanks to the easy to understand and well-explained lessons have become enthused again and plunking away every chance I get. Thanks Pat!" "Pat is the best online teacher i have come across. His lessons are very well thought out." "Pat is such an excellent teacher in all that he does and his delivery instruction is above and beyond. So glad I found his website." "I've not long started playing the dobro and I find Pat's lessons easy to follow and well presented. Pat really helped me get started with his beginner's lessons. I would have been struggling without them." "I'm so happy to have come across Pat's lessons. I find that the best learning for me comes from a well spun tune that pulls me into it, revealing cool licks and phrases that I'll be able to use in other tunes. If it's really well thought out, I get to pick up a rich toolbox of technique as I go. Pat has packed all of this into his arrangements, making learning exciting and fun. Pat's video accompaniments untangle the knots that would have held me back much longer, showing an economy of playing that makes a higher level of playing possible." "I’ve just started learning the dobro and Pat's lessons are great, especially how they are broken down into small sections and played slowly. Thanks Pat, keep the lessons coming!" "I recently purchased the dobro lesson for "Sweet Beulah Land" and would like to say this is a great lesson. The presentation is excellent...very easy to follow. I will purchase more lessons in the future...Nicely done, Pat, and thanks a bunch!! I dig what you do!" "Pat's lessons are just amazing in comparison with the offer available on line. The video quality, practice tracks and support documents (tabs) are top-notch and immerses the user in a musical environment which fosters more attention to playing and provides lots of enjoyment as you progress. If you are a newcomer to steel guitar or just want to expand your repertoire, I highly recommend his "Song Lessons", A MUST HAVE ! The site provides an excellent navigation experience with secure payment methods. Pat also excels in customer care and promptly responds to inquiries and specific requests. I am a fan... and seldom found so much value for money!" "I'm a beginner/intermediate weissenborn player and I've been looking to take my playing to the next level. With Pat's videos I've been able to learn a couple songs that I've really wanted to learn for a long time. He does a great job of breaking the songs down into very simple steps. He even helps me learn a little music theory along with weissenborn. My understanding of the notes along the neck of the weissenborn has increased quite a bit. I honestly feel like this is better than a live weissenborn lesson. I can pause and replay over and over. I can practice as much as I want and I can replay it whenever I want. Great work, Pat. I highly recommend." "As a beginner I am so impressed with Pat's clarity of tablature and video presentation. I will definitely be purchasing more lap steel lessons from him in the near future and would not hesitate to recommend him to anyone interested in lap steel guitar." musically inclined. I have downloaded lessons from two other sites: Pat's is by far the best!" "I've downloaded several lessons from Pat and found the tabs set out very clear, the video and sound are of highest quality and simple to understand, all step by step. I had a problem downloading as I made a mistake, I emailed Pat from Tasmania and within 15 minutes I had a reply and was able to correct my problem. I highly recommend Pat's lessons, they are great!!!" "Really useful lessons beyond just being able to play the number being taught they will help you to get your head around other music you want to play. A good grounding." "Pat's teaching is perfect for me. The close-up of your left and right hands in synch, and the measure-by-measure counting and tabs is so conducive to learning. Both visual and learning-by-ear students can effectively learn with your videos. Your music theory is great for students who understand music theory, without staying so long on the subject as to bore others. You show how to put feeling in the music, and not just to play notes. I will be using many of your videos and telling others." "The action of the right and left hands is very valuable and well done. Your commentary is quite helpful as well. I am an amateur so your going through each measure slowly is extremely helpful. All in all your lesson presentation is the best I have seen. I will be doing more with you in the future. Thanks so much for the professional presentation." "I recently started to play dobro and found Pat's lessons on YouTube. His lessons are clear and well explained. I also went through technical issues on my iPad (not enough space) and Pat has helped me until everything was fixed. "I am really excited to find Pat's lessons. He's an excellent teacher and his music choices are really fun. There can never be enough dobro options in the world! Recently I ordered a lesson and had problems downloading it in my rural Alaskan town (slow ISP). Pat responded to my problem very quickly and worked hard to solve the problem. Thank you, Pat!" 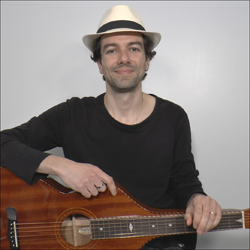 "I am studying resonator and weissenborn guitar online and Pat's lessons, tablature and performance tracks are some of the best I have found. I like Pat's attention to the little details of learning how to play the song, and his gentle patient presentation. He has been very responsive to my emails and questions. "I have found Pat's method of teaching to be straightforward and easy to follow. If you want to learn very nice arrangements for solo guitar work, these are some of the best I've been able to find on the Internet. Keep them coming Pat, I'll send you a few ideas for some tunes that would work very well with your unique playing style. A lot of what is learned in these lessons can be applied to your own improvising." "Purchased Pat's lessons and was having trouble downloading. He was quick to respond to my problems and assist in me getting the download to work. Have reviewed the information and am now trying them on my Dobro, his instructions are great! At age (somewhere between 60 and the grave), who says with the proper instructions you can't teach an old dog new tricks? Thanks Pat for your patience and instructions!" "I took a look at Pat's dobro program and I have to say it's very comprehensive. Great for us new to the instrument. Pat shows a very methodical way to learn, and it doesn't seem overwhelming where you feel panicky trying to keep up. The progress I'm making is good, it's encouraging. Thanks a bunch Pat, I'll certainly be back for another lesson." "Good information, especially for beginners like me. I made more progress with Pat than any other online teacher of the Dobro. "Pat's lessons are very well done, easy to follow and well-paced. His arrangements are simple enough for a beginning lap-slide player to master but still complex enough to sound lovely." "Pat does a fabulous job with his lessons, very clear with explanation and demonstration. The audio and video are excellent as well. I recently purchased some lessons for Weissenborn style guitar. The way the lessons are set up, I found it easier than expected to make good progress right away! Pat is also very patient not only with his instruction but also his interaction with me on the lessons I purchased. Out here in the wilds of Washington State we still have lousy internet so I wasn't able to do the downloads at home. He very patiently and with much courtesy worked with me so a friend in Seattle could download them for me. "These are the only lessons that I learn something from...Pat's style of teaching is great and understandable unlike others who are at times confusing. The one good teaching site for both the dobro and the weissenborn on line in my opinion. Keep them coming, Pat!" "If you are looking for dobro lessons then look no further than learning with Pat. The lessons are crystal clear and everything explained in great detail. The picture quality is fantastic and Pat obviously cares a lot about what he does. Living in Scotland, it is not easy to find anyone who teaches dobro and after trawling the internet for lessons I have finally found what I am looking for. In just two lessons my playing has improved already. Keep them coming Pat, I am looking forward to future lessons! Thanks again!" "I found with Pat all that I expected to start playing the dobro. The lessons are clear and relevant. You feel that Pat wants to help you learn and he does it in a very natural and positive way. Pat also responds quickly when needed. I bought the "Amazing Grace" lesson which allowed me to learn smoothly. Now I really want to tackle something more punchy, such as "Freight Train". Go for it! you will not be disappointed :)"
"As a beginning Weissenborn player I'm excited to start my lessons with Pat. His videos are excellent and his arrangements beautiful, clear and concise. I'm starting with "Time After Time" and then will jump into "Freight Train"." "I recently purchased the tab and tracks to Josh Graves signature song "Fireball" and this is the most accurate transcription I have heard. Highly recommend Pat's lessons to anyone wanting to learn the Dobro." "All of Pat's videos are spot on. I really like how you break down counting the rhythms and your other video offerings with basic fundamental music theory. Quite often teachers provide video or online instructions at a pace that is too fast for the beginner. I would recommend your videos to any beginner or beginner/intermediate." "As a newcomer to the Weissenborn I am really enjoying Pat's learning materials. High quality video and sound, straightforward to follow and a personable teacher. Very reasonably priced too. Thanks Pat, keep them coming!" Aron Radford - Weissenborn recording artist and administrator of "The Weissenborn Information Exchange"
"I can only speak as a 67 years old beginner, Pat is great, his lessons are to the point and fully understandable. He does not show off with a bunch of hot licks and things you can not grasp as a beginner. He has helped me more than anyone! thanks!" "I whole heartedly and unreservedly recommend Pat's lessons for all levels of square neck / lap style steel guitar students, including folks beyond beginner level who want to learn specific songs, some of the music theory we all reluctantly have to learn, and much more. The pace of the lessons is good even for beginners. The tablature included in each lesson is very helpful. The backing tracks to practice along with are invaluable for those of us who do not have an infinitely patient backing band to play behind us as we learn the chords and scales. Thank you, Pat, for advancing my knowledge and chops!" "Have just finished learning Pat's arrangement of "Amazing Grace". It's such a wonderful tune with lots of different arrangements available, but none to match this one, in my opinion. The relaxed approach, but superb tone & playing style, that Pat brings to his lesson, makes learning a pleasure. I found it both simple & challenging. A slow arrangement with fairly simple right hand picking, but a real challenge to achieve precise intonation & allow the tune to rise to its potential. To me, these are the most enjoyable tunes to practice, & I just love to put the backing track Pat provides into a loop, & get lost in the melody as I try to get the tone & feeling it deserves. I know this will help me in my journey to become a better dobro player. Thanks Pat!" "I've tried video instruction from many teachers and often found them more discouraging and sleep inducing than helpful. I like the way you break your instruction down by measures and allow the user to advance at their own pace. Moreover, as an instructor, you're patient and totally unpretentious which makes learning from you a lot easier regardless of the student's performance level." "I would highly recommend Pat's Dobro lessons. I have learned very quickly by watching and absorbing Pat's methods and techniques. His presentation and style of explaining proper instructions is easy to understand and grasp. The video and camera angles are very sharp and clear, which makes it easier to follow along. The tablature and jam tracks provided with each lesson are very useful and professional. Very polished, a great musician and teacher that wants to help you learn! I look forward to many more lessons! "After watching a sample of Pat's work on Resohangout, I was persuaded to purchase a pkg. arrangement of Amazing Grace, the popular Gospel song that is well loved and often played. Pat's version is additive to the overall simplicity and beauty of its reverent quality. It was available in both a simpler and buildup arrangement and comes with detailed measure by measure, highly visual. video instruction. I encourage both the beginner and intermediate player to give Pat's teaching material, a shot, as his products are affordable and complete. Although I don't personally know Pat, he seems to be a down to earth fellow who will work with you if there is a download problem due to the size of the files as Dropbox links are an available option should file resume be necessary due to slow servers as was my case." "I have met Pat a few years ago, when he hired me as a drummer in his band called Melodic Murmur. For many years I have wanted to learn guitar, and playing with him made me want to go for it. During all my life as a musician, I have never met anyone so inspiring. Pat knows a lot about music, he has a deep understanding of what it all is, and he loves to transmit his knowledge. Above all, he can teach you how to learn. That’s what he’s done for me. I’ve had the privilege to have him as a face to face teacher for three years, and he’s made of me the guitarist I am today. Pat, I do love you, keep up the good work with LWP !"